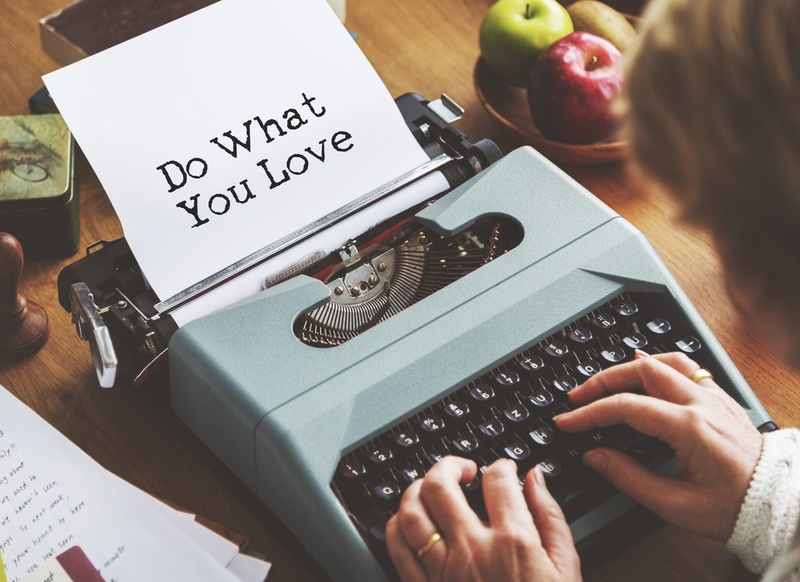 We’ve all heard the phrase “love what you do and you’ll never work a day in your life,” but I struggled to understand this for much of my career. See, I started out working on TV shows and like most people, I loved what I did... until I didn’t. That moment when the thing that I loved became my “job” was pretty disheartening for me, and I responded by deciding I needed to make a change. So, I thought about what I enjoyed. At the time, it was connecting with people, sharing stories, and becoming a tech and social media savvy millennial. Hence my shift from TV sets to a digital marketing agency. To be fair, both my roles in TV and as a marketer were “jobs” in every sense of the word. They paid/pay the bills and came with a certain amount of responsibility, but they also put me in situations where I did and do interact and collaborate with a variety of bright, creative people every day. After I took a step back to think about this shift, I realized something. It wasn’t that I no longer loved what I was doing, but in the day-to-day of it all, I lost sight of what I loved about it. I started to think about what was missing that made me feel this way and I realized that it was passion. When I first walked onto a studio soundstage or developed my first marketing strategy that built a connection between people, I was in awe. I was inspired. I was passionate, and I wanted to get that back. I wanted to get it back because I believe that to do something well you have to have a passion for it. I think most, if not all, people can relate to this. You are the strongest advocate and cheerleader for something when you have a true passion for it. To do this, I began to think about the day-to-day differently. I hunted for my passion in that of the people I interacted with every day. Listening to my clients tell me how they were trying to make a difference by providing something that someone needed or hearing my coworkers talk about how much they loved certain clients and wanted so badly to help them succeed. Those were the kind of interactions that sparked a passion within me and I think that being able to be passionate about helping others is at the core of who we are as people. Being able to recognize that as the key function of my “job” is what reignited that passion. When I did this, I stopped thinking about my day-to-day tasks as things that needed to get done and I started thinking about what those things could do for my company and the companies I was working with. I saw the value and outcome rather than just the tasks. It didn’t take long to see a difference in myself and my work. Soon, I started thinking about how I go about marketing and how I guide others to go about marketing -- it was all about passion. Sure, there are plenty of best practices and strategies out there and a lot of them are incredibly effective, but at the end of the day, no matter what product or service you are trying to sell, you are trying to sell it to people. Emotionally connecting with people is the one sure way for you to be successful in your marketing goals. This, however, is more difficult than ever. Everyone is different and it’s not like you get a convenient profile of every person that visits your website or interacts with your business. More often than not these days, your customers’ first interaction with your business isn’t in person with a smile and a handshake, but online with a website or Facebook page. It is becoming increasingly challenging to make a connection with your customers and prospective customers. So how does a company, big or small do it? By tapping into their passions. All businesses were started because someone had a passion for the product or service they were offering to people. Look at Blake Mycoskie, the founder of TOMS shoes, for example. He built a brand around his passion for helping children in need through a successful for-profit business. The original shoes he produced were simple slip-ons but he grew a loyal and booming customer base by showing his passion and attracting others who shared it. Sharing his story and the story of the difference every customer made in a child’s life through the simple act of purchasing a pair of slip-on shoes caused that passion to spread. That is a powerful feeling and an incredibly powerful marketing tool. People inherently search for connections in their lives -- connections to other people, connections to experiences, even connections to a brand or mission. Those connections, personally, professionally, or even through marketing, are made through feelings. When a company can successfully connect with people through personal stories and shared experiences, a bond is created that fosters trust and confidence. It builds a sense of loyalty to a brand. There have been countless studies on how emotions influence our decisions to buy certain products or brands. I mean, who can forget Budweiser’s 2014 “Puppy Love” Super Bowl commercial? Making people feel something for your brand leaves a lasting impression and it isn’t very hard to do if you are passionate about it. Being passionate about your business helps others to see it as something more than just a business. It turns your product or service into one with a purpose. It becomes something for them to be excited about and something they want in their life. It is often hard to break from the traditional impersonal approach in favor of a more personal one, but it can make a big difference. One of the things that I am lucky enough to do as a marketing strategist at IMPACT is to help people to think about their passion. It takes a minute of thoughtful consideration, but then there’s a great a-ha moment and a flood of stories about origins and purpose are shared. That feeling in that a-ha moment… that is the feeling that you want your customers to have when they think of your business. Feature your employees on your website and social media so that people see the dedication and passion that they have for what they do.